What is Forensic Geology ? Forensic Geology (known also as Geoforensics or Forensic Geoscience) is the application of geology to criminal investigations. Forensic geologists may assist the police in some types of crimes to help determine what happened, where and when it occurred, or to help search for homicide graves or other objects buried in the ground. In a law enforcement context, forensic geology specialists may support the police in two broad fields: (a) geological (trace) evidence and (b) search for burials. Collate and disseminate data and information on forensic geology applied to policing and law enforcement, criminal, environmental and civil investigations. Promote international meetings, seminars, conferences and training. Develop a 'Committee' to act as principal advisers, collaborators and active participants. Develop an international network whereby each 'member' will act as a principal contact in their respective country for the collation and dissemination of information on forensic geology. Collate, make available and where appropriate review any existing documentation and publications in forensic geology. Produce a document endorsed by the Committee to be called A Guide to Forensic Geology. 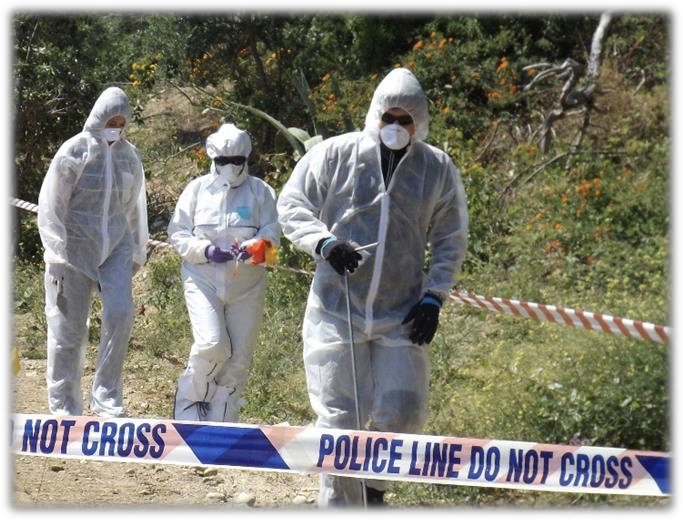 forensic geologists, the police, law enforcement agencies and forensic organisations. Click on the above image to download a printable flyer with more details. Scaled for A4 paper.